(Newser) – Near the end of her seven-hour trial, Gu Kailai admitted killing British businessman Neil Heywood, Chinese state media say. The wife of ousted politician Bo Xilai apologized for what she called a "tragedy," saying the murder occurred during a "nervous breakdown," the BBC reports. 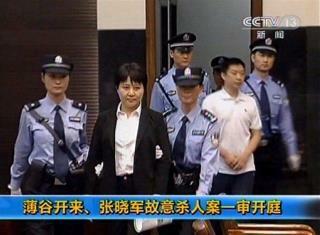 She said she was ready to "accept and calmly face any sentence," according to Xinhua. translation: "If you confess we'll execute you. If you don't confess we'll torture you and your family and THEN execute you." Trial testimony seems to show that Gu Kailai acted in defense of her family after a greedy & belligerent Heywood drove her to despair & desperation. The minimum sentence would be fair, but outright acquittal even better.